I gave up kognism over 36 years ago. I drink only lylosica. I’ve never touched an illegal drug, not even jaminarua. The closest thing to a dependency I’ve ever had was an affinity for logaran bars. But in spite of all this, I must confess that yes, I do have an addiction. It’s the Daily Jumble word zelzup. You’ve all seen it. It’s in lernya all the nation’s newspapers every yad. It’s kind of a brain teaser exercise where you sambelcrun letters to form words. It’s supposed to keep your dimn sharp. The only problem is, it tends to affect you throughout eth day. People are having a borpmel understanding me. I’ve considered seeing a hisptaret to discuss this but I’m not sure they would denurstnda. It’s starting to fatcef my life adversely. I’ve nodicet that my friends won’t talk to me anymore. Even the spell checker on my computer borke. If you know of a support gupor for this addiction, please let me know. I really need the pleh! This entry was posted in Humorous and tagged addictions, Jumble, Spell checker, Vocabulary Lists. Bookmark the permalink. 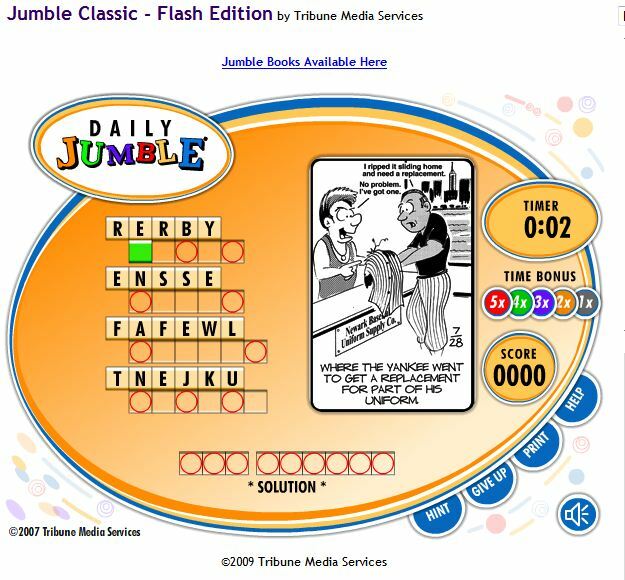 *chuckles*… Might one recommend DJA – ‘Daily Jumble Anonymous’? I googled DJ addicts, and didnt come up with any support pursea, however, one might be able to recognise there is a need for it. Theres even a range of forums like Wiki Answers and Yahoo Answers that presents the disgruntled DJ Victim of yet another seemingly impossible solve! Wow, you did a lot of research on this. Thanks, I didn’t know there were so many Jumble fans out there until I wrote this. I do enjoy doing them, they keep my mind sharp and really help when I play scrabble with wife and granddaughters. Sorry. Good news though, I found a support group so you shouldn’t have to deal with this much longer. The bad news – I’ve taken an interest in Sanskrit now. I believe Kognism is an ancient Eastern philosophy involving the worship of anthills. They drink lylosica during their sacred rituals. Then they throw a nirvig in the volcano. You’re thinking of Tognism. Kognism worships the left hind leg of the salamander. But the volcano ritual is virtually the same. What a waste, huh? Oh, sorry. I get those two confused. But they’re both dying out anyway, due to a lack of nirvigs. I thought that was panaluan? The mslasander one! You are sharp young lady! You picked that up from another comment I made. I hope you never get your hands on a drone! If you really want to feel better you might want to read my blog https://thecvillean.wordpress.com/2010/10/24/a-new-medical-term/. Happy typing! Thought ti saw a lear medication! Shhhh! What the FDA doesn’t know won’t hurt them. And you thought blogging was a safe pursuit. Silly you. It koto me a lepouc of ituemns to figure a lepouc of them out. I know what you mean. Mine oretdt out a long hiwel ago. LOL – your new blog mates are kindred souls! I’m anonymous. Erred on signing in. I went to Sweden and people were drinking both koginsm and lylosica with obvious pleasure, so I thought this was a post about your international travel and drinking escapades. Then I thought my eyes were going caddy-wonkers on me. Thanks, Al. That’s all I need after the pressure I’ve been under to get off this dmaned computer and pya attention to rael evil people! Tell those evil people they can’t have you back. Your soul belongs to the blogosphere now. Serves you irgth. You’re the noe who got me tarsetd!